Like-for-like sales at the bakery chain were up 8.2% in the last five weeks of the year. There was a time when the Greggs was all about pasties and steak bakes, but that era could be coming to a close. In a bid to attract more 'on-the-go' shoppers the bakery chain has rolled out a range of healthier and more premium items as a key part of its turnaround strategy, and it looks to be paying off. Today it announced like-for-like (LFL) sales were up 8.2% in the five weeks to January 4th and said that customers were lapping up its new products - particularly its steak and cheese roll and its fresh soup, sales of which were up 50% in the last three months of the year. LFL sales were up 4.5% for the whole year and 6% in the final quarter. 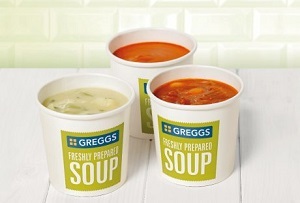 'Customers have clearly responded to the improvements in our product offer and service, designed to meet the needs of the food-on-the-go consumer, during this busy period,' said Greggs chief executive Roger Whiteside. Whiteside was brought in to Greggs in 2013 and tasked with turning its fortunes around. In the first half of that year like-for-like sales had fallen 2.9% and profits slipped by £4.6m to £11.4m. In 2014, the company refurbished 213 of its 1,650 shops, partly as the company shifts away from being a 'bakery' business towards a takeaway model more similar to the likes of Pret a Manger and EAT. Greggs shares leapt to as much as 814p today, their highest ever level and almost double the 430.5p they were at at the start of January 2014. At last count they were up 7.07% to 802.5p. Mild weather and changes in consumer behaviour have played their part, but Whiteside must be feeling pretty pleased with himself.